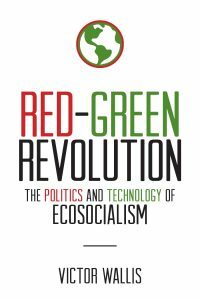 Wallis is the author of the new book Red-Green Revolution: The Politics and Technology of Ecosocialism. He writes: “The disaster that ecological activists of the last half-century have sought to prevent is already vividly present. Its most dramatic expression, apart from the endlessly repeated scenes of fire, flood, parched earth, and emaciated polar bears, is the tens of millions of refugees, desperate for a place to live. Some are fleeing sea-level rise and flooded or storm-battered homes; others are fleeing wars precipitated by sustained, drought-induced collapses of the food supply (as in Syria, Central Africa, and Central America). Still others are fleeing wars and repression that reflect long-standing imperialist projects, but whose initiators have become ever more intransigent as they seek to ward off the prospect of a diminished resource-base. “Increasing percentages of the refugees, if they survive their typically harrowing treks or dangerous sea voyages, come up against vast numbers of agents ‘trained, armed, and paid to stop them.’ This drive to ‘stop them’ is promoted by a ruling class which at the same time relentlessly stokes the economic engines of capital that gave rise to the climate crisis in the first place. While the top U.S. mouthpiece of this ruling class, along with his acolytes at the Environmental ‘Protection’ Agency, mocks the reality of climate change, the military leaders who command the system’s armed enforcers have had no hesitation (for at least the last fifteen years) in publicly situating what they acknowledge to be the consequences of global warming — the droughts, floods, and hurricanes that directly or indirectly have pushed mass migration to its current extreme levels — at the center of their concerns.